How to get there: On the corner at the junction of the N70/N71. The Brook Lane Hotel, which is the only 4 Star boutique hotel in Kenmare, adds an urban chic dimension to the accommodation sector, having superb rooms and doing excellent modern food. The Brook Lane is very conveniently located on the corner of the road leading to, or from, Sneem and the Ring of Kerry, which means that you are very close to the centre of town. All you have to do is dump your car and stroll around doing the boutiques, galleries and pubs, without worrying whether you will find a parking space or not - Kenmare is a busy spot renowned for its pubs and restaurants. 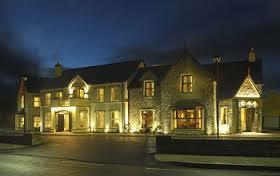 The Hotel has been done with immense panache – cool and contemporary – and unlike anywhere else in Kenmare. It is what today’s traveller wants and deserves in the line of comfort and luxury without being overly expensive. Their ethos is to ensure that their customers receive the best of Irish hospitality with professionalism and individual service. Brook Lane Hotel caters for guests who value difference and for whom ambiance, decor and quality of service are important. Designed to the highest standards this contemporary cool hotel enjoys superb facilities throughout and offers guests a haven of peace. There are 21 newly decorated bespoke bedrooms offering luxury and style with fluffy robes and heated bathroom floors to keep your toes warm. They also have DVD players, handmade toiletries, demister mirrors, and slippers. They also have personal safes, and ironing boards, everything is there. Whether your room is Superior, Deluxe or a Junior Suite, you can’t go wrong. Colours are neutral with lots of big brown leather cosy chairs to settle into and the service is excellent and friendly. They also have a fine meeting room with a capacity for up to 50 people including an internationally designed room which is the ideal venue for corporate presentations, exhibitions, seminars and product launches at the top end of the market. Every facility for ensuring a successful event is on hand at Brook Lane Hotel for conferences with high speed internet access and audiovisual equipment can be arranged according to your needs. Brook Lane also cater for weddings and a wedding co-ordinator is available to help you plan your perfect day. When it comes to food, their Casey’s Bar and Bistro produces excellent modern cuisine, both Irish and International, using and best of local and seasonal produce. Having perhaps just done the Ring of Kerry you will be hungry so for dinner you can start thinking of delicious pan-fried scallops on ginger bread, followed maybe by monkfish with a chilli and coriander cream, or roast breast of Aylesbury duck on hot and sour cabbage. In summer, Irish Nights (not every night so do enquire when booking) are organised for diners and you may well get to see a Bodhran, a traditional Irish musical instrument, being played. So at The Brook Lane you will get the very best of chic modern hospitality with a bit of tradition thrown in for good measure.